Everybody plays the game of lottery winner on occasion, debating what you'd purchase if a million-dollar ticket suddenly appeared in your pocket. The key is to pick unnecessary and delightfully expensive luxuries. For you LEGOphiles in the crowd, I've found what you should buy after the requisite trip to LEGO headquarters and LEGOLAND in Billund, Denmark. It's a pair of BrickSpeak speakers from ToysPeriod. 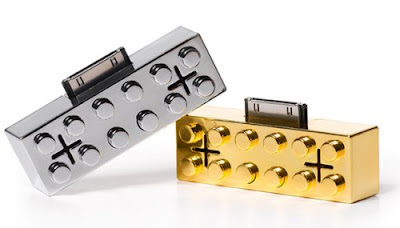 At $647, they are apparently a set of high-end speakers encased in over 1,000 LEGO bricks. Although at that price, you could 12,940 bricks on BrickLink and just fill it with Sony guts. But until that ticket appears, you can make do with a set of mini-Ipod speakers ($19.75) or an Ipod dock ($45).